"You might feel like making lasagna in a pressure cooker is crazy. Don't you need an oven for those crunchy edges? To make sure the meat is cooked through? How can anyone make lasagna without baking it? Well, trust us - this one is well worth making. 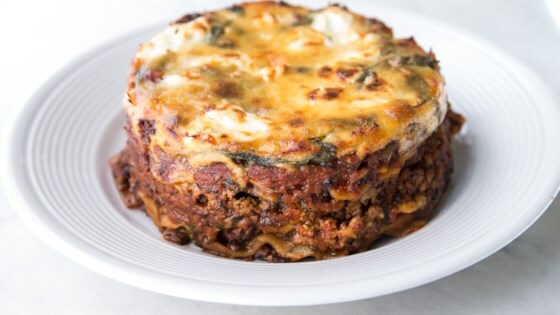 If you have a 6- or 7-inch springform pan and you kept the trivet that came with your Instant Pot®, you can make a delicious layered lasagna pie in 30 minutes. And if you want to make it ahead, you can prep the lasagna, put it in the freezer, then put it right into the Instant Pot® for an easy dinner." Turn on a multi-cooker (such as Instant Pot(R)) and the select Saute function. Heat olive oil; add ground beef and salt. Cook, breaking it into clumps with a spatula, until thoroughly browned, about 6 minutes. Transfer beef to a bowl. Wash the pot and return it to the machine. Pour 1 1/2 cup water into the pot. Set the metal trivet inside. Arrange lasagna pieces over the bottom of a 6-inch springform pan. Ladle 1/3 the tomato sauce on top; add 1/3 of the cooked beef and 1/3 of the fresh spinach. Dollop 1/2 the mozzarella cheese on top. Repeat layers using 1/2 the goat cheese. Repeat once more, finishing with remaining mozzarella and goat cheese on top. Tent the top of the lasagna loosely with aluminum foil. Lower it gently onto the trivet. Close and lock the lid. Select high pressure according to manufacturer's instructions; set timer for 20 minutes. Allow 10 to 15 minutes for pressure to build. Release pressure using the natural-release method according to manufacturer's instructions, 10 to 40 minutes. Unlock and remove lid. Transfer the springform pan carefully to a baking sheet. Broil until cheese on top is lightly browned and bubbling, about 5 minutes. You can use regular lasagna noodles instead of the no-boil type if desired. I love my Instant Pot, didn’t care for this at all. Very lackluster- there are some really great IP lasagna recipes out there. Give this one a pass. I used frozen spinach, american cheese slices and it still turned out delicious. Thanks for the recipe! The goat cheese was just the right touch! This was tasty and we enjoyed being able to make it in the Instant Pot!